Dab the julienne potatoes in cornstarch. Heat sufficient oil in a kadai and deep-fry the potato julienne. Drain onto an absorbent paper and keep aside. Make a thick batter of gram flour, salt, ginger paste, garlic paste, half the chopped green chillies, half the crushed red chillies and water. Heat the oil in the kadai. 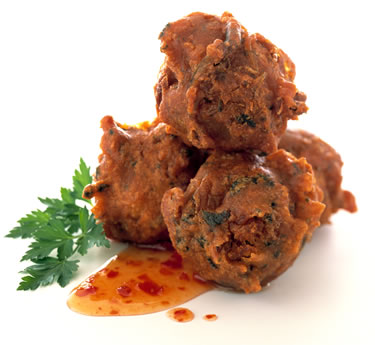 Dip the brinjal roundels in the batter and deep fry. Drain them onto an absorbent paper and then put them in water. Mix together yogurt, remaining chopped green chillies and salt. Dry roast peppercorns, cumin seeds, mustard seeds, fenugreek seeds and powder them. Add asafoetida, rock salt and rest of the crushed red chillies. Take out the brinjal roundels from water and gently press to remove water. Arrange in a dish. Pour the yogurt mixture over the brinjal roundels. Sprinkle the spice powder generously over them. Garnish with capsicum, tomato cubes and potato juliennes and serve. lovely one Devika! i'll try it soon.